Nýlegar gervihnattamyndir af Öræfajökli sýna að nýr ketill hefur myndast í öskjunni síðastliðna viku. Flugstjóri í farþegaflugi náði einnig ljósmyndum af katlinum í dag og sendi Veðurstofunni. Ketillinn er um 1km í þvermál og endurspeglar nýlega aukningu í jarðhitavirkni í öskju Öræfajökuls. Svo virðist sem jarðhitavatn hafi lekið hægt undan katlinum og komið fram undan Kvíárjökli, en brennisteinslykt hefur fundist í nágrenni við Kvíá síðastliðna viku. Líklega er mesta vatnið nú þegar runnið undan katlinum. Aukin skjálftavirkni hefur verið síðustu mánuði, en heldur hefur dregið úr henni síðustu daga. Þessi gögn benda til aukinnar virkni í eldstöðinni sem hefur ekki gosið síðan 1727. Engin merki eru um gosóróa eða yfirvofandi eldgos. Landhelgisgæslan mun fljúga með vísindamenn til að kanna aðstæður og taka sýni í fyrramálið. Veðurstofan hefur aukið vöktun á svæðinu og fylgist vel með í samráði við jarðvísindamenn Háskóla Íslands og Almannavarnadeild Ríkislögreglustjóra. Veðurstofa Íslands hefur í kjölfar þessarar auknu virkni hækkað litakóða Öræfajökuls í gulan. 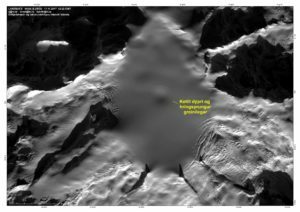 New satellite images of Öræfajökull volcano shows that a new ice-cauldron has formed within the caldera in the last week. Pilot flying over the area took pictures of the cauldron today and sent them to the Icelandic Meteorological Office. The cauldron is about 1 km in diameter and it reflects a recent increase in geothermal activity within the caldera. It seems that geothermal water has been slowly released from underneath the cauldron to the glacial river of the Kvíárjökull outlet-glacier (SE flank of Öræfajökull volcano). Associated with this water release sulphur smell has been reported nearby Kvíárjökull since last week. Most of the water has probably already been released. An increase in the seismic activity has been recorded for the last few months, but for the past days it has been low. This data indicates increased activity of the volcano which has not erupted since 1727. Currently there are no signs of an imminent eruption. The Icelandic Coast Guard will fly over the area with scientists tomorrow to collect additional data and samples. 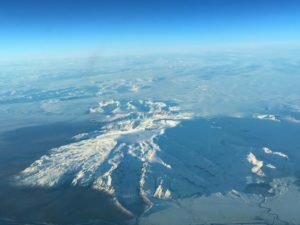 The Icelandic Meteorological Office has increased the surveillance of the area and is monitoring the volcano closely in collaboration with scientists from the University of Iceland and the Icelandic Civil Protection Authorities.